After nearly four months in Belize we decided we had earned a holiday. 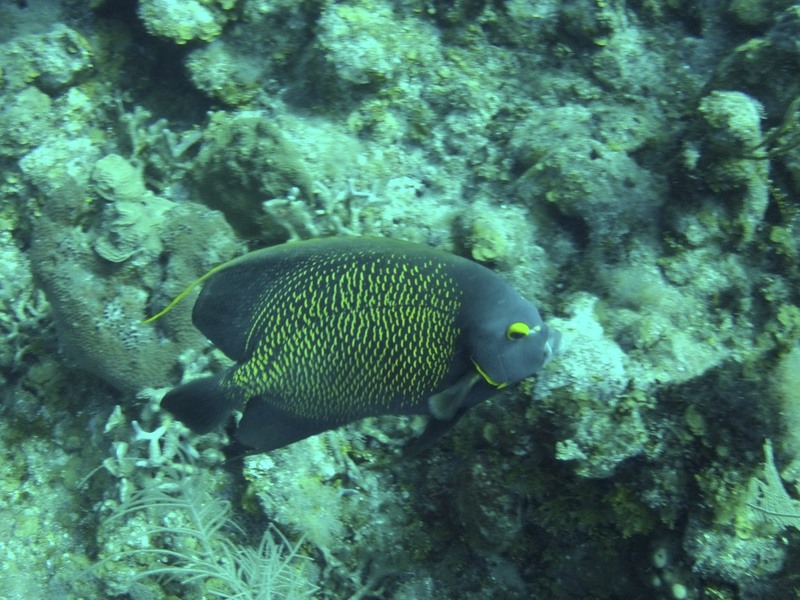 So with Karen’s amazing sleuthing skills she found a dive package on the island of Roatan. 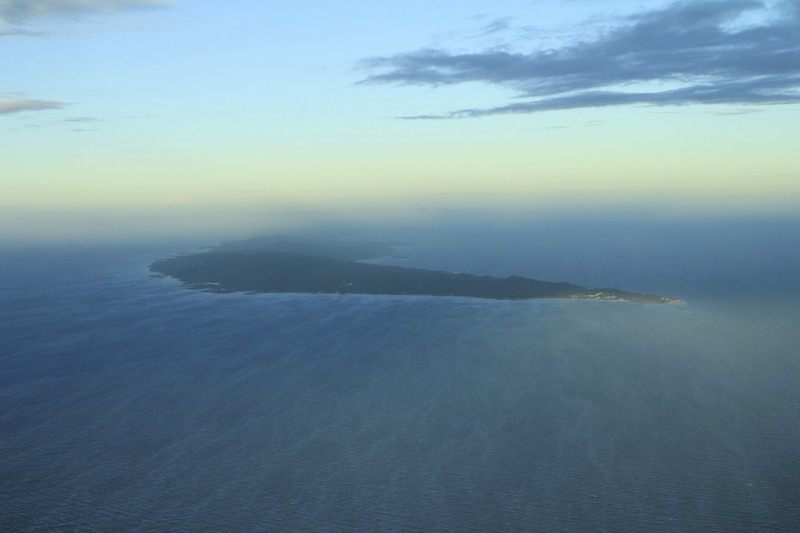 The largest of the islands that make up the Bay Islands of Honduras. Initially we were planning on going to the island of Utila, however the difference in travel time was ridiculous for two destinations so close to each other. For Roatan from San Pedro we left in the early afternoon and arrived before supper time. For Utila we would have had to depart before 4AM and would not have arrived until after 10PM. This was supposed to be a vacation not an epic trek, so Roatan it was. Our first glimpse over the pilots shoulder of the island of Roatan, Honduras. When it comes to clearing immigration, arriving on a plane with only six passengers is the way to do it. The Immigration Officer came and met us at the baggage carousel to deal with our documents. Very pleasant and helpful. We are staying at a resort called Anthony’s Key Resort on the west side of the island. I have to be honest here, if you were hoping for information on Honduras or the island of Roatan you won’t find it here. We were here for the sole purpose of diving. We were outfitted the morning after we arrived and did four dives that first day including a nighttime shore dive. It was awesome. 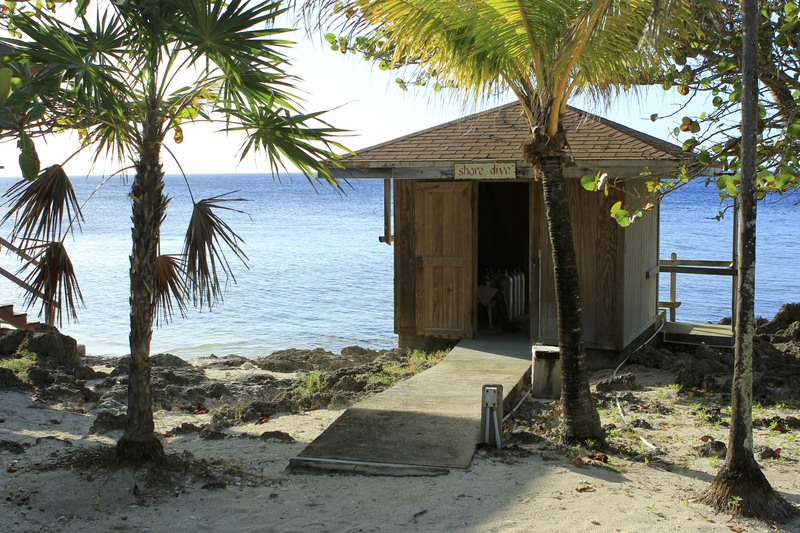 The resort has a hut manned by knowledgeable personnel to brief you on the shore dive. As well they store tanks there so you do not have to carry them over. Nice. Each dive boat at the resort has a Captain and a Dive Master. You stay with the same boat all week which is fantastic. It gives everyone a chance to get to know everyone else. The water temperature has been a very pleasant 76F with the air temperature pushing 90F later in the week. Our Dive Master, Calderon, is very good. Competent and relaxed, allowing people to move at their own pace. 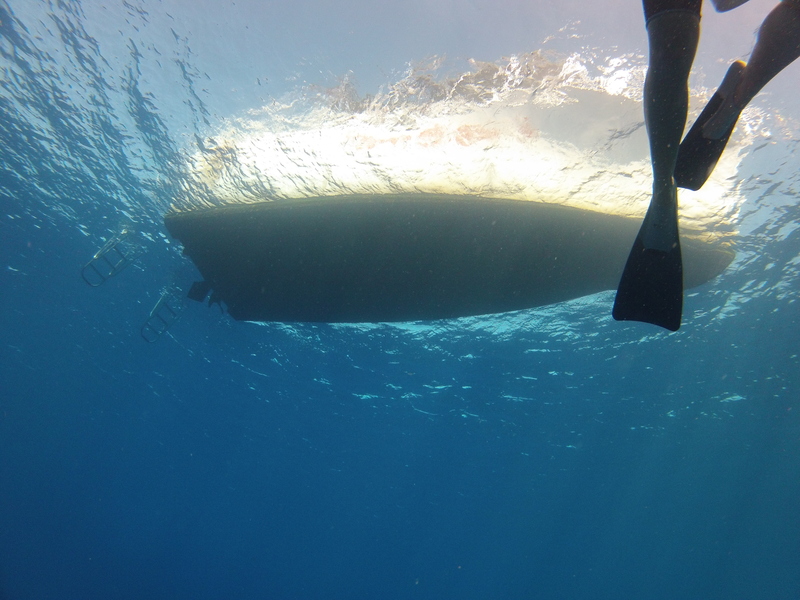 A welcome sight as one nears the end of a dive. The accommodation ranges from slightly rustic to the very comfortable. We ended up in a lovely air conditioned villa out over the water with a beautiful deck. 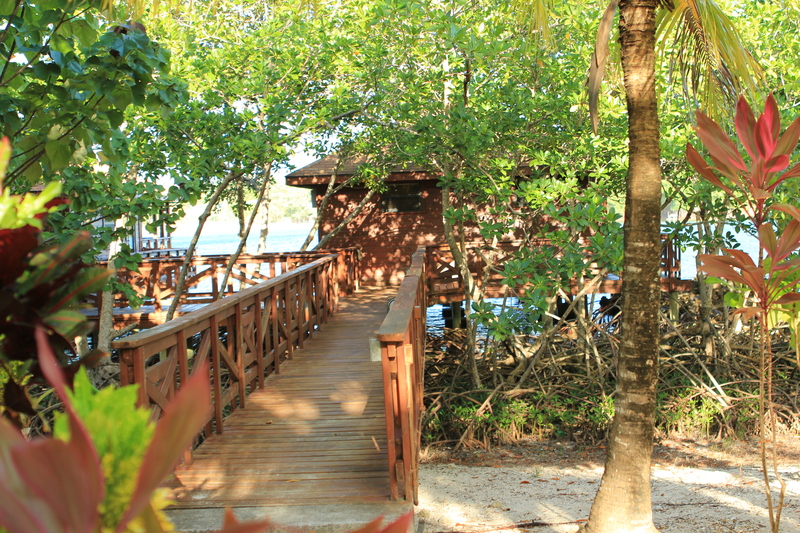 The walkway to our villa out over the water. I unfortunately missed a full day of diving due to an upset stomach, but Karen has been out non stop. She has developed quite the reputation as one of the first off the boat and a fantastic eye for spotting unique marine life. 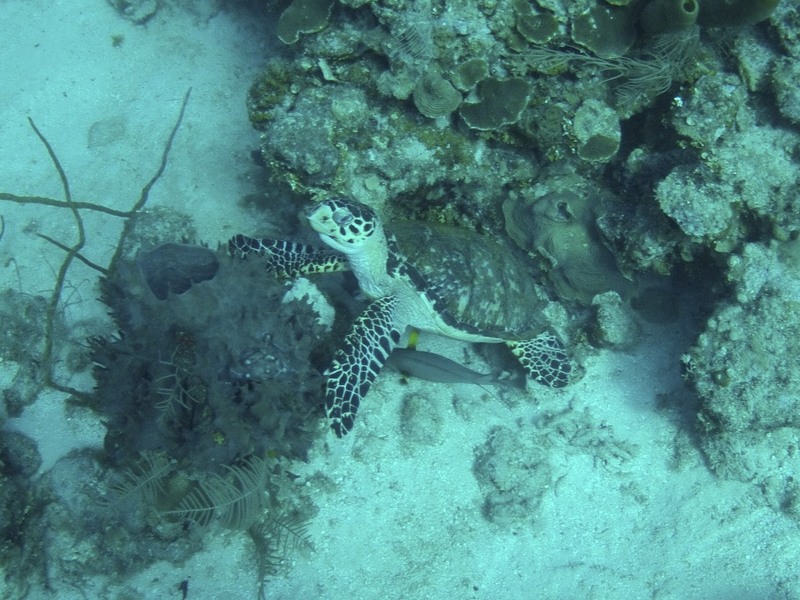 Green turtle making its way to the surface. 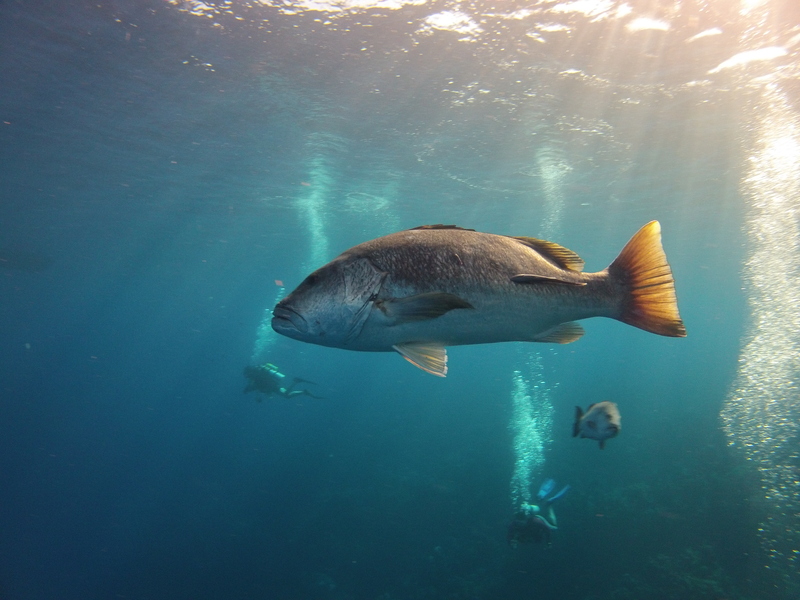 A big old Grouper cruising by. 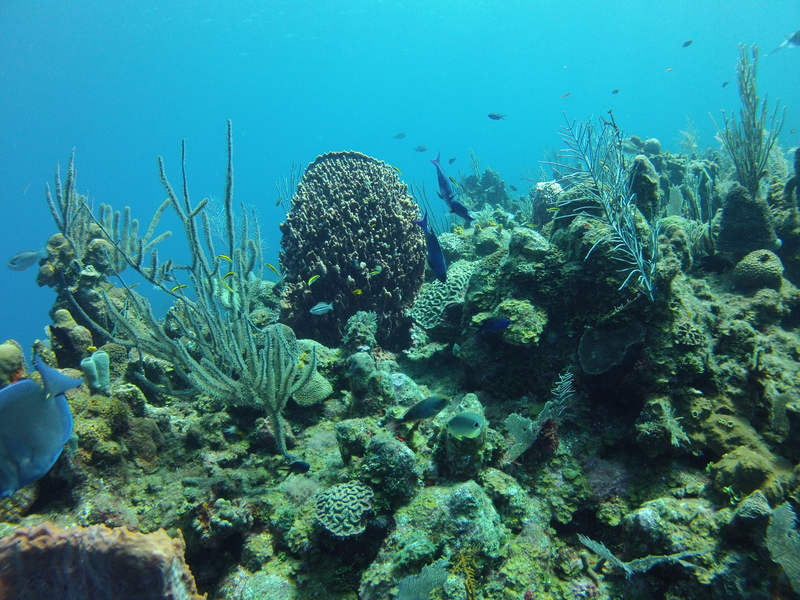 A typical landscape on the reef we are diving. Simply beautiful. 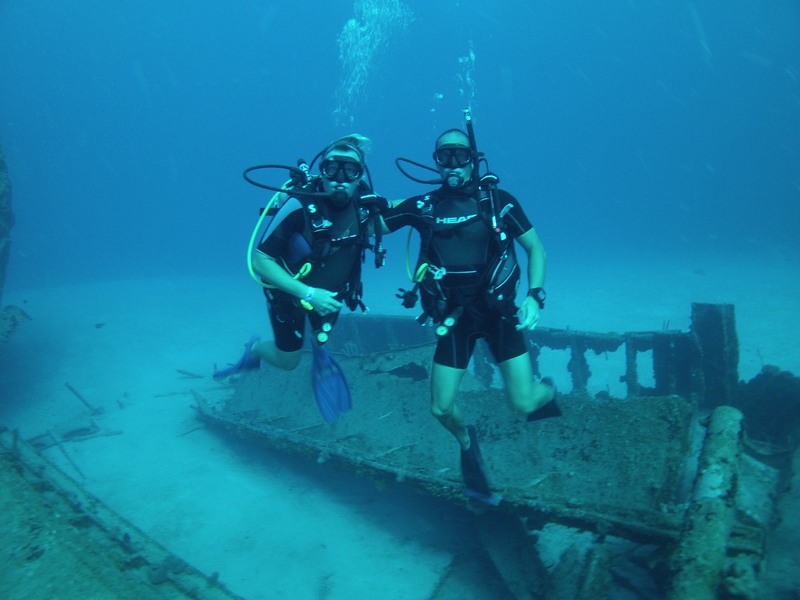 Karen and I received our first real wreck dives as well. Very cool and kind of eerie. Both of the ships were sunk for the purpose of diving. The Aguila 17 years ago and the Odyssey 10 years ago. 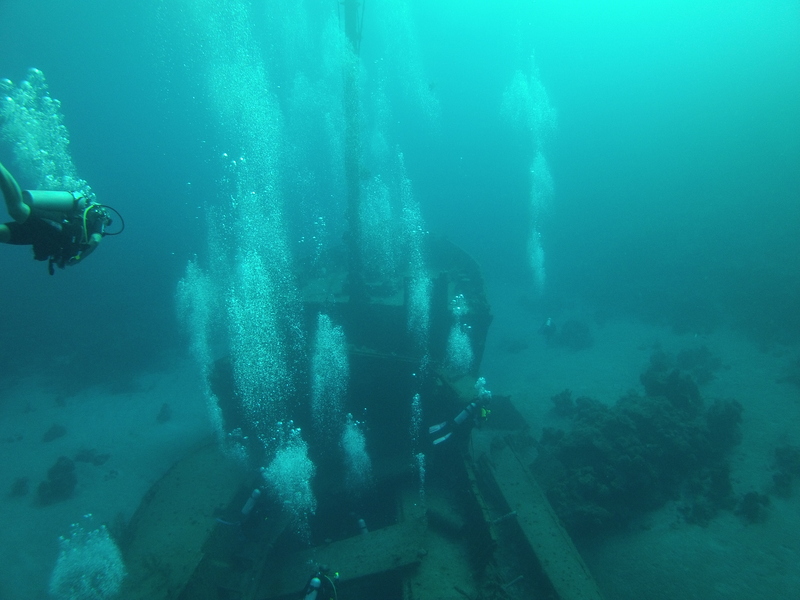 Divers exploring the Aguila wreck. 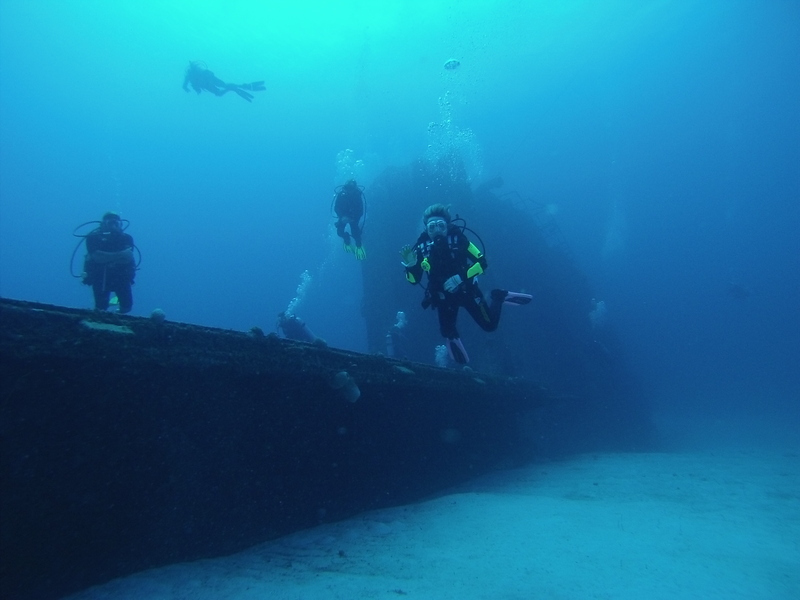 Our diving group exploring the Aguila. 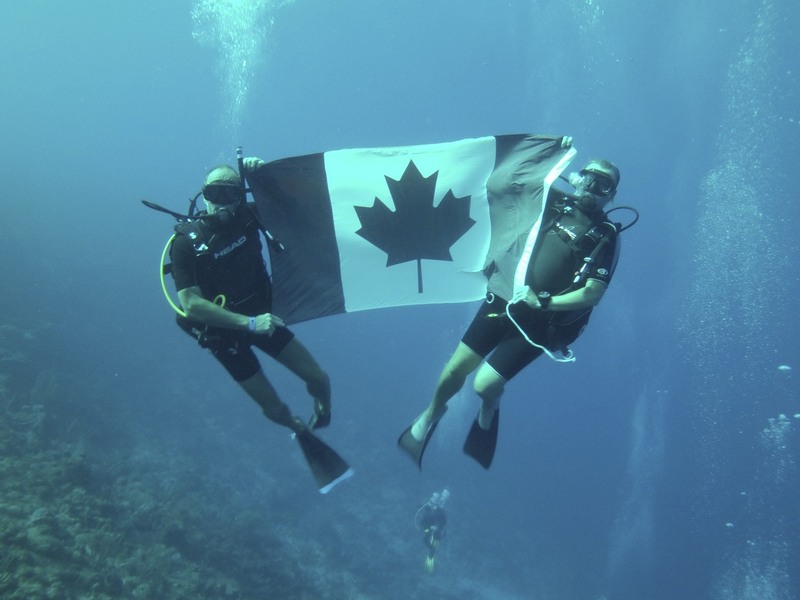 We were diving when the Olympic gold medal game in Men’s hockey was being played, so we unfurled the flag at 85ft in honour of our Olympians. Showing our Canadian pride during the Olympics. Shot of Karen and I by the wreck Aguila. It rests in 110ft of water.